One cannot understand Nazism and the Nazi movement without first understanding its leader. Adolf Hitler was born in 1889 in a small Austrian town near the border with Germany. His father Alois was a civil servant, a cruel and uncompromising man with a short temper who regularly beat his sons. In contrast, Hitler’s mother Klara was kind, caring and supportive. The young Adolf was raised a Catholic and served for a time as a choirboy in the local cathedral. Though intelligent and curious, at school he proved lazy, broody and unmotivated, his only academic successes coming in history and the visual arts. Hitler nurtured ambitions of becoming an artist and in 1909, shortly before his 20th birthday, he moved to Vienna with a dream of gaining admission to the local academy. But while Hitler was a capable artist, he had little originality or natural flair and the academy twice rejected him. He spent the next four years scraping together a living selling postcards and small paintings. When without money, Hitler lived in Vienna’s doss houses (homeless shelters) where he spent time with destitute men. 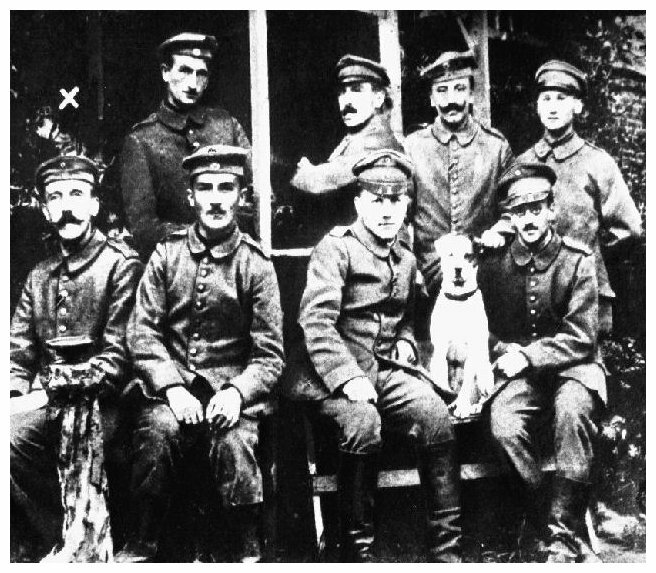 With the outbreak of World War I in August 1914, Hitler crossed the border and enlisted in the German army (he did not wish to serve in Austria’s army, considering it poorly led and too racially diverse). 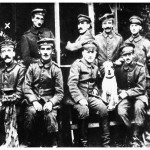 Hitler’s service in World War I provided him with purpose and direction, perhaps for the first time in his life. The young Austrian relished the discipline, camaraderie and order of military life. He proved a brave and competent soldier, albeit in lowly roles. Serving on the Western Front as a trench runner, Hitler often risked his life by moving through dangerous areas and ‘no man’s land’ in order to deliver messages. He was promoted to corporal, mentioned in dispatches and won the prestigious Iron Cross. Hitler was wounded several times, the worst in 1918 when he was temporarily blinded by a gas attack and spent a long period convalescing in a military field hospital. Hitler was devastated by the German surrender and the armistice of November 1918. Like many of his comrades in the Imperial German army, Hitler was convinced Germany could still have won the war. The surrender, he believed, was the work of liberal and socialist politicians who had stabbed their country in the back (he later described this group as “November criminals”). At the war’s end, Hitler was intent on remaining in the army. In the spring of 1918, he accepted a posting to the ‘Enlightened Commandos’, a newly formed unit tasked with sniffing out suspected communists and infiltrating small political groups. In September 1919 Hitler’s superiors ordered him to attend the meetings of a small political group called the Deutsche Arbeiterpartei (the DAP, or German Workers’ Party). While he was sent to spy on this small group, the 30-year-old Hitler became captivated by its passionate meetings, powerful speeches and political debates. Within weeks Hitler had resigned from the army and joined the DAP. Within two years he would be its leader. The critical factors in Hitler’s rise to power within the DAP were his intense personality, political passion and his oratory. Many outsiders considered Hitler – with his Chaplinesque moustache, quirky body language and passionate rhetoric – as something of an oddball or a political loon. But many who met Hitler during this early period spoke favourably about his charisma. The DAP leader was reserved to the point of shyness but had an intense, piercing gaze and obvious passion for political issues. Hitler’s appeal broadened largely through his skilful public speaking, a talent he discovered in 1919 and worked hard to improve and refine. Hitler’s speech making emphasised the power of emotion and delivery, rather than content and rationality. To outsiders, his speeches may have seemed spontaneous or unplanned – but this was far from the case. The mechanics of Hitler’s oratory were meticulously planned and choreographed. He often arrived late to meetings and rallies, deliberately keeping his audience waiting to heighten the sense of expectation. Many of his speeches began with a series of questions or challenges, delivered quietly, calmly, almost hesitatingly. The NSDAP leader would then begin to address these rhetorical questions and provide his own answers. As he did, the urgency and volume of his voice escalated and his gesturing and gesticulating became more exaggerated and dramatic. In most of Hitler’s speeches, he launched bitter attacks on those he considered Germany’s national enemies, usually communists, liberals, Jews and foreign governments. In November 1923 Hitler’s party – by now re-formed as the National Sozialistische Deutsche Arbeiter Partei or NSDAP – staged an attempted coup in Munich. It was a dismal failure, in large part because Hitler had grossly overestimated the level of support for his party. Confronted by government troops and Munich police, Hitler and his followers were fired on and several were killed or wounded. Hitler himself was arrested and charged with high treason. His trial in early 1924 should have exposed the plottings of a twisted mind; instead, it gave Hitler a public platform to air his political views. Hitler was eventually found guilty and imprisoned for five years, though he was treated leniently and released after just nine months. While in prison Hitler assembled his first and only book, Mein Kampf (‘My Struggle’), which was part-autobiography and part political memoir, a rambling collection of his political, social and racial theories. 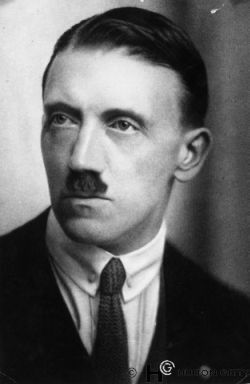 The majority of Hitler’s ideas about nationalism, government and race were hardened during his hunger years in Vienna, his experiences of World War I and his bitter disappointment with the treatment of Germany after World War I.
Hitler was profoundly racist, clinging to fanciful ideas about Aryan supremacy. He despised Jews and other non-Aryan races such as Slavs, Romany and blacks, considering them untermensch (‘inferior men’). He was a fervent German nationalist, who believed in the cultural superiority of the German people. Hitler wanted to restore German greatness by ridding the nation of Weimar democracy and restoring state power and authoritarian government. He wanted to overturn the Versailles treaty and quash the much-hated war reparations. He imagined a future ‘Greater Germany’ where all of Europe’s German-speaking Aryans would reside in one powerful state. He believed that German-speaking Europeans were short of arable land and room to prosper; he wanted to rectify this by obtaining lebensraum (‘living space’) from the inferior peoples of eastern Europe and Russia. In his personal views, Hitler was a social and sexual conservative. He believed women should stay out of politics and the workplace; their place was in the home, as wives and mothers. He was himself nervous around women, preferring the company of other men. With regard to government, Hitler loathed democracy and parliamentary politics, associating them with weakness, indecision and infiltration. He instead desired the creation of a Third Reich: a revival of the great German empires of historical times. This new regime would boast a strong authoritarian government under the control of a powerful leader. It would cleanse Germany of communists, a group that Hitler loathed, and purge the nation of racial ‘undesirables’ such as Jews. None of Hitler’s ideas and prejudices were new, nor were they particularly unusual for the time; intense nationalism, authoritarianism and anti-Semitism could be found in dozens of political groups in post-war Germany. What made Hitler and his followers unique, however, was their success. By the late 1920s, Hitler and the NSDAP had moved from the dark margins of German politics and become a legitimate contender for political leadership. 1. Adolf Hitler was born in an Austrian town near the border of Germany. He was the son of working class parents, a short tempered civil servant and a gentle Catholic housewife. 2. After a failed period attempting to become an artist in Vienna, Hitler found his purpose in the Germany Army during World War I, earning medals for bravery in the trenches. 3. In 1919 he joined a small nationalist political party, the DAP. The following year he became its leader, largely on the back of his compelling and passionate political speeches. 4. Hitler’s political views revolved around nationalism and the restoration of German power, authoritarian government, re-armament and the expansion of Germany (lebensraum). 5. Hitler was also a social and sexual conservative who clung to traditional values and believed that women should work only as housewives and mothers. J. Llewellyn et al, “Adolf Hitler”, Alpha History, accessed [today’s date], https://alphahistory.com/nazigermany/adolf-hitler/.